A not unfair criterion is afforded of the long prevailing and continued misconception as to the origin of chess, by the lack of knowledge regarding early records as to its history exhibited in the literature of last century, and the press and magazine articles of this even to the present year. We refer not to lines of poets such as Pope, Dryden and others, with whom the ancient order of fiction is permissible, or to writers of previous periods, from Aben Ezra to Ruy Lopez, Chaucer and Lydgate, or Caxton and Barbiere, but to presumably studied and special articles, such as those given in Dictionaries of Arts and Sciences and in Encyclopaedias. The great work of 1727 dedicated to the King— which claimed to embody a reasonable and fair account—and even the best knowledge on all subjects referred to in it; contains an article on chess of some dimensions, which may well be taken as an example of the average ignorance of the knowledge of information existing at the time. The Chinese, it says, claim to date back their acquaintance with chess to a very remote period; so with the best testimonies of that country, which acknowledge its receipt from India in the sixth century the writer seems to have been quite unacquainted. Nothing occurs in the article as to the transit of chess from India into Persia, next to Arabia and Greece, and by the Saracens into Spain; neither does a line appear as to Egyptian probabilities, or the nature of the game inscribed on edifices in that country. Though abounding in traditional names of Trojan heroes, and others equally mythical as regards chess, the more genuine ones of Chosroes of Persia, Harun, Mamun and Mutasem of Bagdad, Walid of Cordova, the Carlovingian Charlemagne of France, Canute the Dane, William of Normandy the English kings are entirely absent, nor is there a word concerning Roman games or the edict which refers to them in which Chess and Draughts (both mentioned) were specially protected and exempted from the interdiction against other games; which has escaped all writers, and would certainly, if known about, have been deemed of some significance. The Persian and Arabian periods from the time of Chosroes, to Harun, covers the Golden Age of Arabian literature, which is more prolific in chess incident than any other; yet even this and Firdausi’s celebrated Persian Shahnama, and Anna Comnena’s historical work escapes notice. We may perhaps, not implicitly trust or credit, all we read of in some of the Eastern manuscripts biographical sketches; but there is much of reasonable narrative we need not discredit nor reject. We may feel disposed to accept, with some reservation, the account of the 6,000 male and 6,000 female slaves, and 60,000 horses of Al Mutasem, (the eighth of Abbasside). The prodigious bridal expenditure, comprising gifts of Estates, houses, jewels, horses, described in the history of Al Mamun (the seventh of Abbasside, and the most glorious of his race), may seem fabulous to us; the extraordinary memories of certain scholars narrated in biographies, who could recite thousands of verses and whole books by heart may appear worthy of confirmation; the composition of two thousand manuscripts by one writer, and the possession of forty thousand volumes by another, may somewhat tax our credulity. We may feel a little surprised to hear that Chosroes’ chess men were worth an amount equivalent to one million of our money in the present day; we may doubt, or disagree with the opinions attributed to Hippocrates, or to Galen; that cures were effected, or even assisted of such complaints as diarrhea and erysipelas by the means of chess; or, that, as the Persian suggests it has been found a remedy of beneficial in many ailments from the heart ache to the toothache. We may doubt whether the two Lydian brothers, Lydo and Tyrrhene, in the story of Herodotus really diminished the pangs of hunger much by it; but, amidst all our incredulity, we can believe, and do believe, that Chosroes and chess, Harun and chess, Charlemagne and chess, Al Mamun and chess, Canute and chess, are as well authenticated and worthy of credit, as other more important incidents found in history, notwithstanding that encyclopaediasts and writers down from the days of the Eastern manuscripts, the Persian Shahnama and Anna Comnenas history to the days of Pope and Philidor, and of the initiation of Sanskrit knowledge among the learned, never mention their names in connection with chess as exponents of which the Ravan, king of Lanka of the Hindoo law books, the famous prince Yudhisthira and the sage Vyasa of the Sanskrit, and Nala of the poems, and in more modern accounts, Indian King Porus, Alexander the Great and Aristotle, are far more reasonable names inferentially, if not sufficiently attested, than those cherished by traditionists such as Palamedes, Xerxes, Moses, Hermes, or any of the Kings of Babylon or their philosophers. The ever growing popularity of chess is forcibly and abundantly proved in a variety of ways. One conclusive proof of it is afforded by the enormous and ever increasing sale of Chess Equipages, Boards, Men and Figures, Diagrams, Scoring Books, Sheets, &c., a somewhat matter of fact, it is true, but at the same time practical, reliable, and satisfactory species of evidence. Its progress is further attested by the extreme favour in which Chess Tournaments both International and National, are held, at home and abroad, which attract a degree of attention and awaken an interest little dreamt of during any past period of the history of the game; and it is further illustrated by the continued formation of Chess Clubs in every sphere, the ever widening interest in the home circle, and by many other facts which indicate with absolute certainty its highly enhanced appreciation among the thoughtful and intelligent of all classes of the community. 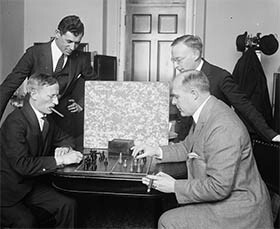 The humble and working classes have, in recent years, began to avail themselves very considerably of the enjoyment of the game, and this is a powerful and laudable ground for gratification, because chess, besides being innocent, intellectual and mentally highly invigorating, though soothing also, is essentially inexpensive and does not tend to the sort of excitement too often occasioned by some other games where the temptation, too often indulged, of spending money principally when losing, in hopes of obtaining supposed stimulating consolation and nerve, is so frequently manifested, that it appears at times to be so irresistible an accompaniment of the game as to become almost a condition and part of the play. The degree of intellectual skill which chess admits of, has been considered and pronounced so high, that Leibnitz declared it to be far less a game than a science. Euler, Franklin, Buckle and others have expressed similar views; and the Egyptians, the Persians, and the Arabians according to many writers, including Mr. Warton and the Rev. Mr. Lambe, have also so regarded it. Chess is so ancient that, by that distinction alone, it seems taken beyond the category of games altogether; and it has been said that it probably would have perished long ago, if it had not been destined to live for ever. It affords so much genuine intrinsic interest that it can be played without pecuniary stake; and has been so played more than all other games put together, and continues to be so during the present time on occasions, by the very finest players. It exists, flourishes, and gains ground continually and prodigiously, although the average annual support in amount for first class chivalrous chess competitions, tournaments and matches in all Great Britain does not equal that put on in former years as the stake of a good prize fight; whilst the receipts of a great football match at Bradford and other important cities, which can be named, exceeds the combined incomes of all the few remaining British chess masters derived from chess instruction and skill in play. Chess is, moreover, surrounded by a host of associations, and is suggestive of a pleasant mass of memories, anecdotes, manners, and incidents, such as no other game, and hardly any science may presume to boast; and though never yet honoured throughout its long life by any continuous history, or consecutive and connected record, its traditions from time immemorial have been of the most illustrious, royal, and noble character. More apt at figures, than at diction, I have no claim to powers of writing or learning, which can afford me any hopes of doing full justice to so important a task as a worthy work on the history of chess would be; my labours and experience, however, may have enabled me to gather together materials for a more solid and substantial chess structure, than at present exists and I am not without confidence that competent and skilful workers will be found to construct an edifice more worthy of our day, which present, and pending, grand developments will still further consolidate in interest and glory; a building in fact cemented by the noblest and most worthy, praiseworthy, and commendable associations with which the aspiring and deserving artisan and mechanic of the present and future, may be as closely identified as the greatest rulers, deepest thinkers, and most accomplished and profound scholars, and distinguished men of science of the past; affording also a substantial boon, which may be conferred by philanthropists on their less fortunate brethren in society, as it is calculated to induce temperate as well as peaceful and thoughtful habits. A bond of social union also to all who appreciate and care to avail themselves of the relief and advantages which chess is so well known to afford, over other less innocent, less intellectual and more expensive and objectionable movements.